Submitted by rocknicehunter on Tue, 09/23/2008 - 2:49pm. 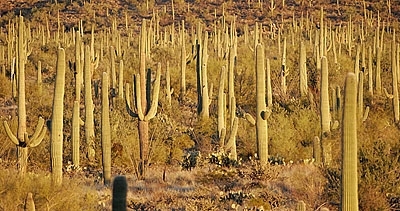 Saguaro National Park is the closest National Park to a major population center. It's two districts, Rincon Mountain on the east and Tucson Mountain to the west literally bracket the city of Tucson, Arizona. Home to thousands of Saguaro cacti, Saguaro NP has over 165 miles of hiking trails which range from easy, level desert trails among these giant plants to strenuous trails that rise thousands of feet into the Sky Island of the Rincon Mountains. This file contains the locations of the two visitor centers, all of the trail heads listed on the NPS maps as well as a number of other locations of interest within the park's districts, including campsites. This file was created with Google Maps, Google Earth, Excel & POIEdit and works on my Nuvi 260.